Dundas was commissioned to write music for a commercial for Kenco coffee. One of the scripts for the commercial involved two old friends, a man and a woman, who met after ten years. Originally no music was planned for the commercial, but when the script writers showed the plans to the head of creative at the advertising agency, he suggested using the Tom Waits track Martha, which set the mood both musically and lyrically for the emotion the commercial intended to convey. The agency approached the publisher Warner for a licence to use Martha, and was quoted a synchronisation licence fee for use of words and music of £25,000 for one year, later reduced to £22,250. No application was made for a quote to use the original Tom Waits recording, the inference being that a re-recording of the Tom Waits song would be made at the agency’s expense. The agency subsequently told Warner that they did not intend to use Martha. The agency wrote new lyrics themselves, and presented these to David Dundas with a commission to write accompanying music. Much detail was also provided regarding the storyboard and characters. They mentioned their original intention to use Martha but were clear in requesting Dundas to provide an entirely original score. The composer Tom Waits saw the television advertisement on a visit to London and contacted his publisher, who contacted a musicologist, Dr Geoffrey Bush, and began proceedings. 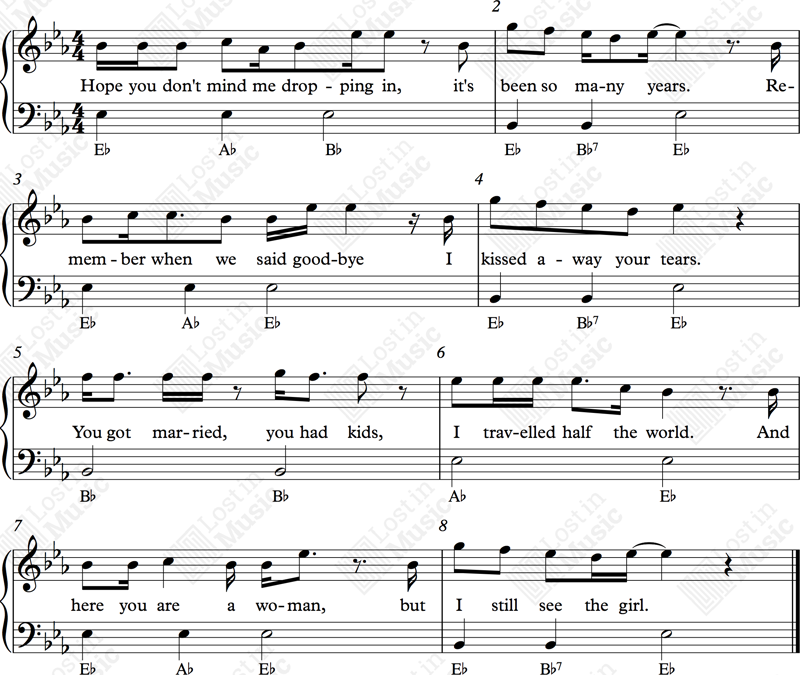 the use in the lyrics of both works of the phrase “it’s been so many years”. that copyright owners need to be able to protect the integrity of the material in their care by being able to approve or reject proposed alterations and arrangements of original works. Mr Harry Rabinowitz, musicologist for the defence, highlighted the fact that Waits’ song itself emulated the style and melody of earlier popular songs, and in particular the traditional spiritual Old Man River. He also argued that at the point the lyrics do coincide, the respective melodies are in fact quite different. The defendants argued that an injunction would cause considerable financial damage to them (as the advertising campaign had not yet run its course) and reputational damage would be suffered both by Dundas as composer and the advertising agency responsible for the commission and creation of the commercial. 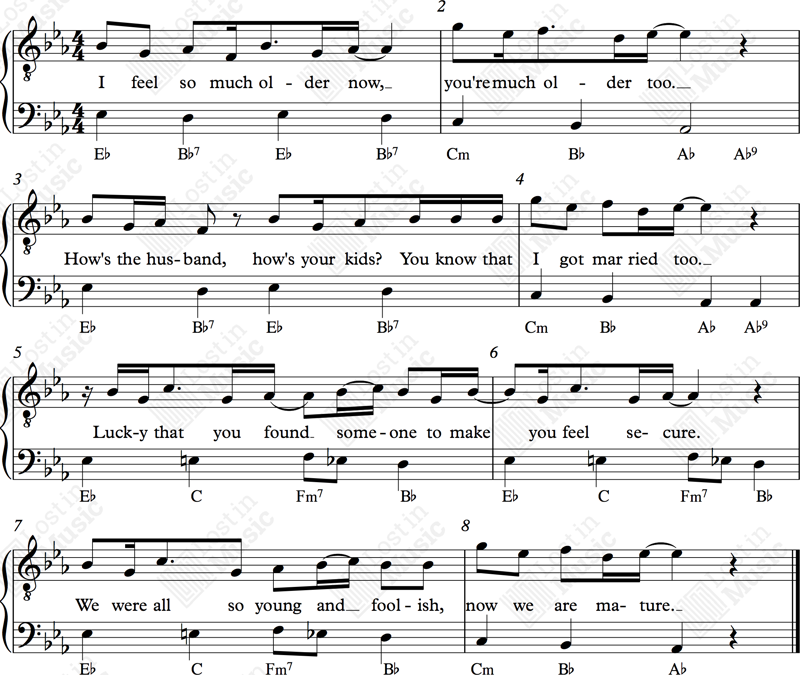 A comparison of the music scores illustrates the resemblances – lyrically in the message, structurally in the four two-bar phrases with A:A:B:B rhyming patterns, and melodically in the notes of the second bar. Of the two works, Dundas’ Seems Like Yesterday is actually the more harmonically accomplished, with stronger harmonies and better musical 'grammar'. Grateful thanks to the Music Copyright Infringement Resource for making a recording and video of the Kenco commercial available. (Waits) © BMG Rights Management (UK) Ltd. Recording by Tom Waits, ℗ 1973, Asylum Records. (Dundas) © Chrysalis Music Ltd (here transposed down from G major original). Recording ℗ unknown. In giving his ruling, Mr Justice Vinelott referred to Warner v de Wilde, where “a very, very strong prima facie case of infringement” of the Chariots of Fire theme in a television commercial for Clarks Shoes caused the immediate grant of an injunction, on the grounds that to allow the plagiarism would undermine the value of the copyright work. He observed that a decision also needed to be based on the relative prospects of success should the infringement claim come to trial, and he felt in this case that the chances of success were “slim”, based on the evidence produced by the claimant. The judge gave his own “untutored ear” summary of the comparison between the two pieces of music. He found Martha to be sad and nostalgic, and the commercial “romantic . . . in a fresh and light-hearted way”. He was unable “to detect any resemblance to Tom Waits’ song” and, in spite of the single line in the lyric that was common to both, he did not feel that sufficient to find a case of substantial copying. Consequently the application was dismissed. The case also bears many similarities to Williamson v Pearson. Both actions were brought by music publishers who believed their copyright had been infringed by a music arrangement made for a television commercial. Warner were obviously encouraged in their action by the success of Williamson Music just one year earlier. How did Warner lose where Williamson had won a similar earlier case? Both defendants had attempted to do the same thing in emulating existing copyright works. The difference lies in the way they did it. In Williamson the infringing work was very clearly a parody, from the outset copying several key elements of the Rodgers and Hammerstein original. In this case the defendant simply took Martha as a reference point from which to write a more original tune. Parody was never suggested. It is important to note that the Williamson case was only successful in injuncting performances of the allegedly infringing musical work. No trial followed to determine whether the music for the Rapide commercial did actually infringe, though the grant of an injunction strengthened the likelihood.